Approximately 50 million students are currently enrolled in America’s elementary and secondary schools (grades pre-K to 12). 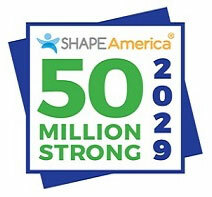 SHAPE America wants to ensure that by the time today’s preschoolers graduate from high school in 2029, all of America’s students are benefiting from the skills, knowledge, confidence, desire and opportunities to enjoy healthy, meaningful physical activity. In your role as a health and/or physical educator, you are uniquely poised to deliver the benefits of living a physically active and healthy life. By coming together as a profession, we can solidify public support for health and physical education as benefiting current and future generations. Join these schools in pledging your students to be part of 50 Million Strong below.